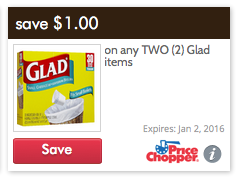 Price Chopper: 2 FREE Glad Food Wrap 200 sq. ft! I would print the $0.75/1 Glad coupons now if you want them, they may go fast!